I enjoy the farmland around my home town and often you can find me making my way across the dirt roads connecting the fields. In with the drying corn and harvested vineyards, the lazy pace of this October day embraced me. The window of my rented Fiat rolled down allowed a cooling breeze scented by the cast away fruit fermenting on the moist soil to come in. The air a sensual intoxicating veil. All day long I had traversed the main road avoiding the rushing traffic that would break this lazy spell. But it was time to start heading home for supper with family. As soon as my tires hit the asphalt there were cars, anxious to keep moving at their determined pace, piling on my tail. Being at the head of this line was disturbing to my peaceful state of mind. I turned down a branching road and away from my torment in the small town of San Martino di Campagna. On the road ahead was a middle-aged woman and man walking with grocery bags in hand. A gentle sight of a couple sharing daily responsibilities returning home. But they had walked past the homes that lined the road and were on the dirt road leading into the forest and fields beyond. As I passed them I was cautiously watched as they made room for me. Even my wave didn’t change their assessment and so I continued down the tree-lined road littered by golden fall leaves. 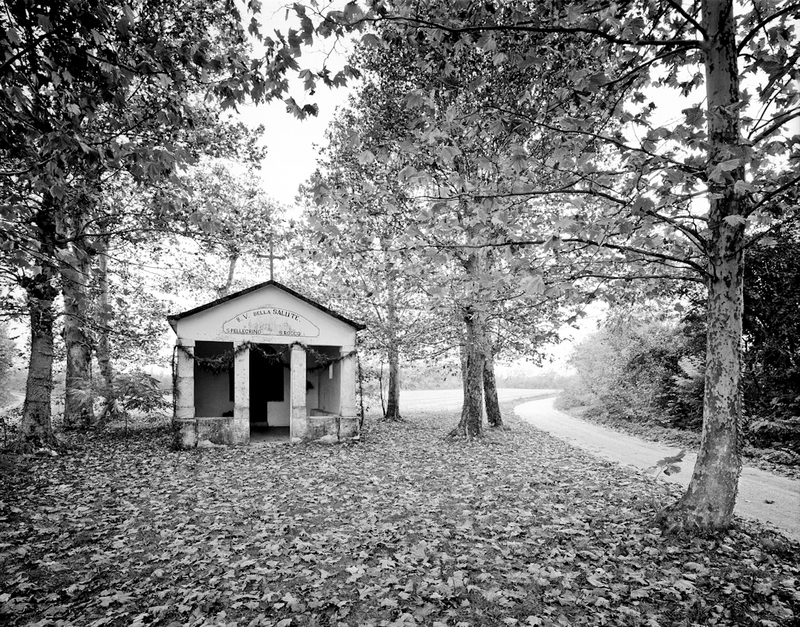 How it could be that this arbored section of road seemed brighter as I approached this roadside chapel, a pilgrims shelter in the angle formed by two diverging roads, was a mystery. A pilgrims shelter gives travelers an opportunity get out of the elements or simply rest. This particular one was designed to protect the traveler from all manner of travail – both temporal and spiritual – with its covered seating area and anti-room containing an effigy of Christ. The couple approached and asked what I was doing. In my accented Italian I simply stated I was photographing the shelter in the beautiful fall setting. As I watched their faces recognize my accent, they asked if I knew their nephew who lived in New York. Sharing his name and phone number for the next time I was in New York, they told me about the pilgrims trail that we were on. They explained it had been part of the Templar estate centered in a nearby village and that there was a string of these shelters crossing the region. They explained that in the past they were places where devoted Christians could be found but of late where hunters and lovers would rendezvous. In the 10 minutes or so of conversation I was touched by this couples gentility and with an “arrivederci,” they continued on to their home beyond my view. I watched after them as they disappear down the road bobbing their heads in conversation. With their disappearance I took this photograph and recognized the lovers in them and the hunter of photographs in myself and that we are all pilgrims.